Recently we had to implement an active-passive redundancy of a singleton service in our production environment where the general rule is always have “more than one of anything”. The main motivation is to alleviate the need to manually monitor and manage these services, whose presence is crucial to the overall health of the site. This means that we sometimes have a service installed on several machines for redundancy, but only one of the is active at any given moment. If the active services goes down for some reason, another service rises to do its work. This is actually called leader election. 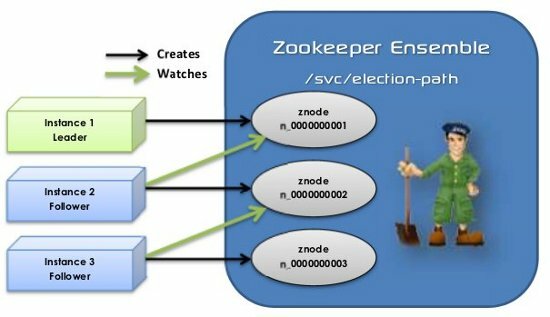 One of the most prominent open source implementation facilitating the process of leader election is Zookeeper. So what is Zookeeper? Originally developed by Yahoo research, Zookeepr acts as a service providing reliable distributed coordination. It is highly concurrent, very fast and suitable mainly for read-heavy access patterns. 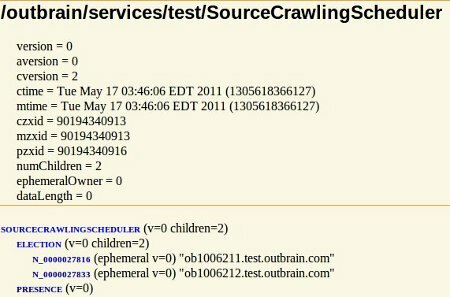 Reads can be done against any node of a Zookeeper cluster while writes a quorum-based. To reach a quorum, Zookeeper utilizes an atomic broadcast protocol. So how does it work? Zookeeper maintains an active connection with all its clients using a heartbeat mechanism. Furthermore, Zookeeper keeps a session for each active client that is connected to it. When a client is disconnected from Zookeeper for more than a specified timeout the session expires. This means that Zookeeper has a pretty good picture of all the animals in its zoo. The Zookeeper data model consists of a hierarchy of nodes, called ZNodes. ZNodes can hold a relatively small (efficiency is key here) amount of data, they are versioned and timestamped . There are several properties a ZNode can have that make them particularly useful for different use cases. Each node in Zookeeper can have the persistent, ephemeral and sequential flags. These determine the naming of the node and its behavior with respect to the client session. The latter two provide the means to implementing a variety of distribution tasks such as locks, queues, barriers, transactions, elections and other synchronization related tasks. Zookeeper allows its clients to watch for different events in its node hierarchy. This way clients can get notified of different changes in the distributed state of affairs and act accordingly. These watches are one timers and should be persisted again by the client after notification. The client is also responsible of handling session expiration which means that ephemeral nodes should be re-persisted after an expiration. Zookeeper requires a lot of boilerplate code, mostly around connectivity and for the majority of the time you will be doing the same things over and over. Luckily Stefan Groschupf and Patrick Hunt wrote a client abstraction called ZkClient. I published a maven artifact for this on OSS so it’s available to our build system. The library also provides a persistent event notification mechanism in the form of listeners. The ZooKeeperClientStatsCollector is a listener implementation which collects stats about session connects/disconnects, exported to JMX as an MBean. Now that we have a working data access layer we can start with the good stuff. The Zookeeper documentation describes in general terms how leader election is to be performed. The general idea is that all participants of the election process create an ephemeral-sequential node on the same election path. The node with the smallest sequence number is the leader. Each “follower” node listens to the node with the next lower sequence number to prevent a herding effect when the leader goes away. In effect, this creates a linked list of nodes. When a node’s local leader dies it goes to election either find a smaller node or becoming the leader if it has the lowest sequence number. One thing to consider here is the nature of the work being done by the leader. Make sure its state can be preserved if its leadership is revoked. Leader loss could be caused by any number of reasons including initiated restarts due to maintenance and releases. It could also be brought about by network partitioning. Designing services for graceful recovery is a requirement for distributed systems not leader election. The service myService is the one controlled by leader election, all its method are going to be suppressed or invoked based on leadership status. This implementation puts a quartz scheduler on standby mode when leadership is revoked and resumes it when it’s granted (notice it will not actually stop running tasks, this will be allowed their natural completion, so in effect you may have a scheduled task running on two services due to partitioning scenarios. This means that whatever is scheduled has to be aware of another service possibly doing the same work. This problem can be easily solved with a Zookeeper barrier implementation, more on that in another post. If you wish to run your data center the democratic way, where important decisions are made in coordination with other stakeholders, Zookeeper certainly helps. Leader Election with Spring is on GitHub, Source shown in this post can be found on Gist. I recently participated in the ILTechTalk week. Most of the talks discussed issues like Scalability, Software Quality, Company Culture, and Continuous Deployment (CD). Since the talks were hosted at Outbrain, we got many direct questions about our concrete implementations. Some of the questions and statements claimed that Feature Flags complicate your code. What bothered most participants was that committing code directly to trunk requires the addition of feature flags in some cases and that it may make their codebase more complex. While in some cases, feature flags may make the code slightly more complicated, it shouldn’t be so in most cases. The main idea I’m presenting here is that conditional logic can be easily replaced with polymorphic code. In fact, conditional logic can always be replaced by polymorphism. While this is a legitimate implementation in some cases, it does complicate your code base by increasing the cyclomatic complexity of your code. In some cases, the test for activation of the feature may recur in any place in the code, so this approach can quickly turn into a maintenance nightmare. Here, we initialized the imaginary feature member by reflection, using a class name specified as a system property. The createImaginaryFeature() method above is usually abstracted into a factory but kept as is here for brevity. But we’re still not done. Most of the readers would probably say that the introduction of a factory and reflection makes the code less readable and less maintainable. I have to agree — and apart from that, adding dependencies to the concrete implementations will complicate the code even more. Luckily, I have a secret weapon at my disposal. It is called IoC, (or DI). When using an IoC container such as Spring or Guice, your code can be made extremely flexible, and implementing feature flags becomes a walk in the park. The spring code above defines an application and 2 imaginary feature implementations. By default, the application is initialized with the oldImaginaryFeature, but this behavior can be overridden by specifying a -DimaginaryFeature.implementation.bean=newImaginaryFeature command line argument. Only a single feature implementation will be initialized by Spring, and the implementations may have dependencies. Bottom line is: with a bit of extra preparation and correct design decisions, feature flags shouldn’t be a burden on your code base. By extra preparation, I mean extracting interfaces for your domain objects, using an IoC container, etc, which is something we should be doing in most cases anyway. Eran Harel is a Senior Software Developer at Outbrain.